A solid wood classic with smooth gentle curves, the Amish Daisy Rocking Chair promises year upon year of comfort and relaxation. This Amish made rocker brings heirloom quality furniture to your home collection and is sure to be enjoyed for generations to come. For the baby's nursery, story time in front of the fireplace or a Sunday afternoon nap in the den, this country style rocker provides all the cozy you could wish for. Exuding warmth from every angle, the Daisy Rocking Chair is country style furniture at its finest. 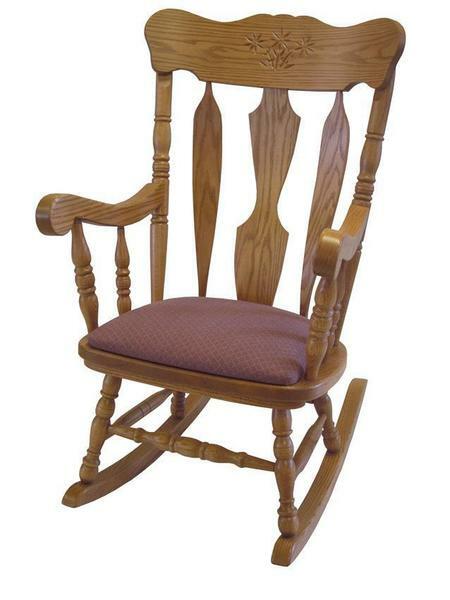 Tall arms reach up to support while the perfect angle of this wooden rocker provides optimum comfort for a restful position. Every element of the Daisy is hand-built to order right here in the USA, promising you nothing but the best in home-grown quality and attention to detail. The Amish woodworkers who craft this wooden rocker take a deep pride in their work, and they love a challenge - if you need any custom changes to this solid wood rocking chair, we'll be more than happy to work with them to bring every detail of your vision to life. Select your premium wood choice for the Daisy Rocking Chair with six wood selections available. Order stain samples to help you pick the perfect finish. The gorgeous high back is ready for your choice of daisy or acorn, or you can choose to leave the back plain and smooth. Seat Height (floor to seat front): 17 1/2"